NASA'slively robotic twosome--the Spirit and Opportunity Mars rovers--are in good shapeto soldier onward in their dealings with the red planet. Bothmachines have come through superior conjunction--when the Sun impedes transmissionsbetween Mars and Earth--and are in fine shape to start new work assignments. Thatsolar conjunction stretched over several weeks, ending in early November. Evenwith the Sun getting in the way of direct Earth-Mars telecommunications, therovers didn't get a rest. Eachwas uploaded prior to the conjunction with science tasks while they stayed put- like weather watching and self-inspecting their respective coatings of Martiandust. Stored data is now making its way from the robots to Earth via NASA'sMars Odyssey spacecraft that is orbiting the red planet. Opportunity has reached,geologically speaking, prime real estate. The robot is surveying VictoriaCrater, a huge impact crater about half a mile (800 meters) in diameter atMeridiani Planum near the equator of Mars. Onthe other side of the planet, the Spirit rover is ready to take on new errandsat Gusev Crater. Approachingthree years of service, the rovers have been working on Mars since landingthere in January 2004. 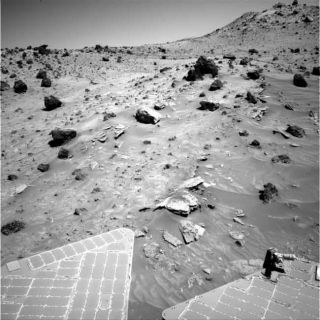 SteveSquyres, lead scientist for the Mars Exploration Rover (MER) mission at Cornell University in Ithaca, New York, said that it was good to hear from Spirit and Opportunity again after coming through the conjunction. They are in excellent health,Squyres reported November 3 on a MER web site hosted at the university. "We'vehad to start up a little bit slowly with Opportunity because the rover's flashmemory was very full post-conjunction...mostly with all the images we tookduring conjunction. It'll take a little while to clear those out," Squyresadvised. Asfor the Opportunity action plan, a decision has been made to steer the rovertoward the east and north, in clockwise fashion around Victoria Crater. "Wehaven't decided how far we'll go in that direction, but it seems clear thatsome of the most intriguing geology we can see from the rim is to be found thatway. So that's where we're headed for now," Squyres declared. Opportunity is moving towardone of the highest spots on the crater's rim, a tall promontory named "Cape St.Mary". Notto be left out in the cold, the Spirit Mars rover at Gusev Crater is beingprimed for more science jobs after the retreat of winter and as springapproaches. "Forthe immediate future, while the [rover's] power is still low, we're going tofocus on other targets right around us on Low Ridge," Squyres told SPACE.com. "We're talking about very small moves that will bring nearby soils and rockswithin reach of the [robot's] arm. So it'll be baby steps at first," he said. Squyresadded that once Spirit's power gets high enough, rover operators will haveplenty of extra energy to wheel the robot to new exploration targets. Thenit'll be time to head back to a feature called "Home Plate". "Andunlike our last trip there, the power will be gradually increasing and we'll beable to take our time," Squyres added. "In fact, there are one or two temptingtargets on the way to Home Plate that we think we'll spend a little time onfirst." OnceSpirit wheels back to Home Plate, Squyres said the focus will be on the westernside of the plateau--a locale that has not been previously explored. Whatis Home Plate in the first place? The feature conjures up a range ofpossibilities, including impact deposits, volcanic deposits or possiblysediment layers caused by wind or water. "They'reall still up for grabs, but there are some hypotheses that are substantiallyfavored over others. We're working on a paper right now that will lay out thestrengths and weaknesses of the various hypotheses," Squyres responded. Oncethe robot slides into Home Plate research mode again, just how long the Marsmachinery will remain on duty there is yet to be determined. "Idon't have any idea how long we'll spend at Home Plate," Squyres said. "Itreally depends on what we find," he observed. Afterdeparture from Home Plate, Spirit's science team already has another targetthey're eyeing. "There'sa new challenge waiting," Squyres noted. "Off toward the southwest there issome terrain that's less than a kilometer away that has a strange 'etched'appearance from orbit... completely different from anything we've seen before.So that's where we'll be headed," he concluded.